Expanded learning programs provide after school and summer learning opportunities to nearly 500,000 of California’s students with the greatest needs through nearly 5,000 expanded learning programs. Expanded learning programs are vital to closing achievement and opportunity gaps by increasing student achievement, engagement, and well-being outcomes. While California is ranked number one in After School nationally, there are significant fiscal challenges and unmeet need for expanded learning opportunities. 1.3 million youth are left unsupervised during the hours of 3pm to 6pm and 2.4 million youth in California would be enrolled in an expanded learning program if one were available to them. Nearly 9 out of 10 state-funded after school programs are being negatively impacted by flat funding for the program while minimum wage and other operating costs have increased. Expanded learning programs offer a strong return on investment. For every dollar invested in expanded learning programs the public saves up to nine dollars. Additionally, there is strong bi-partisan support for public funding for expanded learning programs. The report was officially released at the California Afterschool Challenge on May 10th and 11th where it was shared with members of the California Legislature along with documents outlining the state investment in the ASES program for each legislative district. 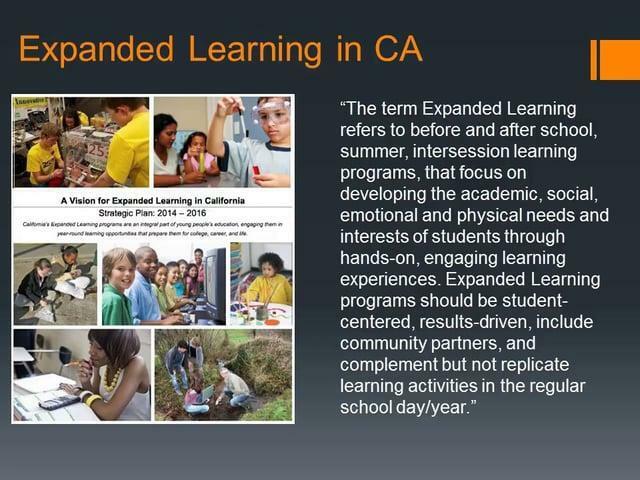 The information in the document provides a great context for expanded learning in California for state leaders, district administrators, and all levels of expanded learning practitioner. It is expected that the California Legislature will be considering whether to include new funding for ASES in the coming weeks, with initial Budget subcommittee votes starting this week. Therefore, the information in the State of the State of Expanded Learning in California may be useful to share with members of the Legislature.